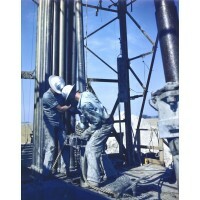 Draw ToolThis Roughneck inspects the drawworksPlease see "SPECIFICATION" tab (above) for exact dimen.. 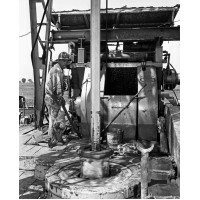 Compound Drilling RigDrawworks and pumps are powered directly by belts attached to an engine m..
Tool Dressers Circa 1910Tool Dressers were required to repair and sharpen drilling toolsPlease see "..
Stabbing Pipe 1940'sRoughnecks stabbing a stand of pipe while tripping in the hole in this early col.. 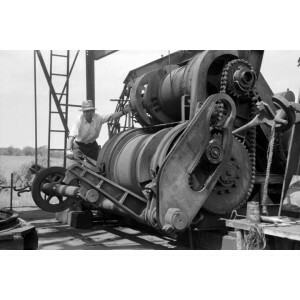 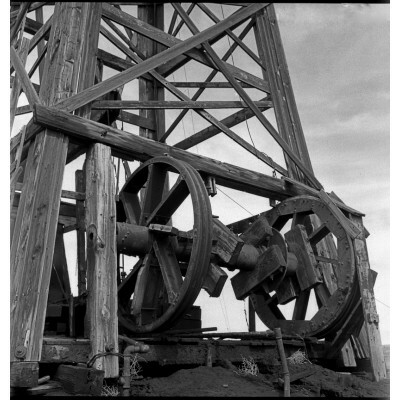 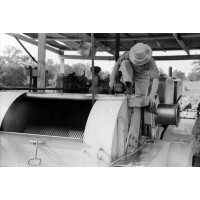 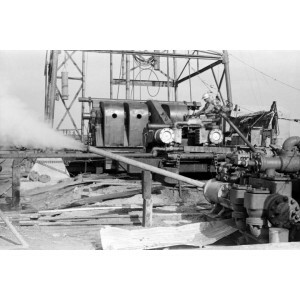 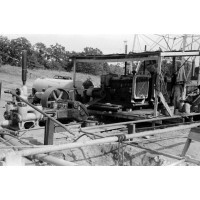 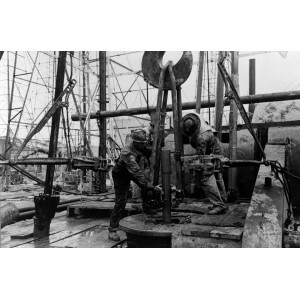 Shooting A Well With NitroNitro was used for "fracking" early wells to break up the formation and re..
Shaffer DrawworksDriller manually drilling down with this Shaffer drawworksPlease see "SPECIFICATION..
Boom Town. 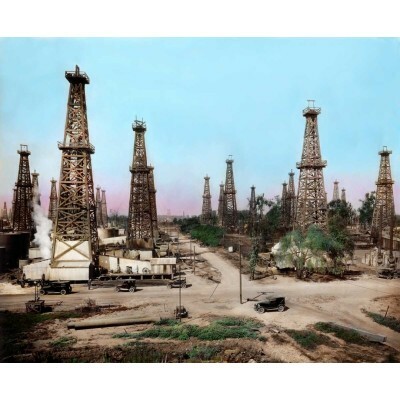 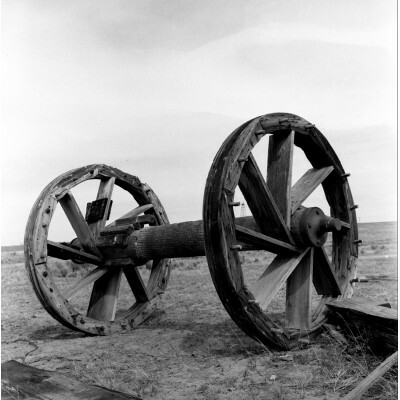 Oil City Cleveland Oklahoma"Boom Town" is an early colorized image of what was then calle..
Bull WheelDerricks like these were built by hand on location by workersPlease see "SPECIFICATION" ta..
Charleston West Virginia Oil DerrickOld wooden derrick standing in a cornfield near Charleston West .. 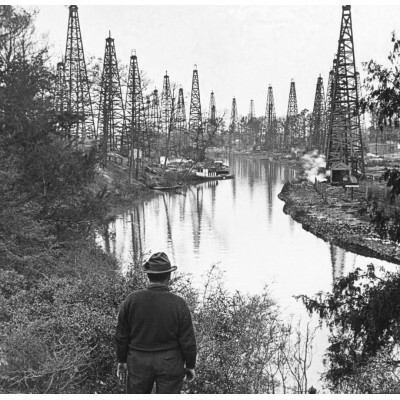 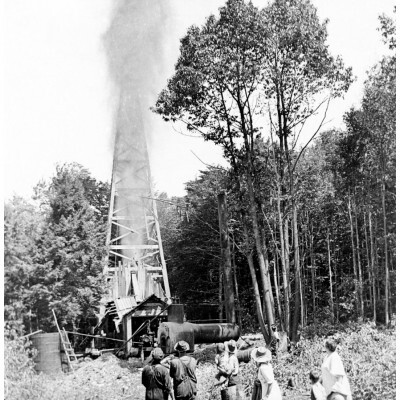 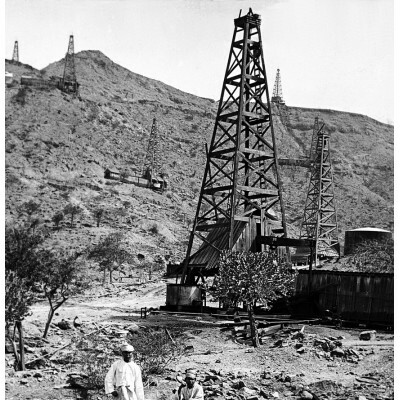 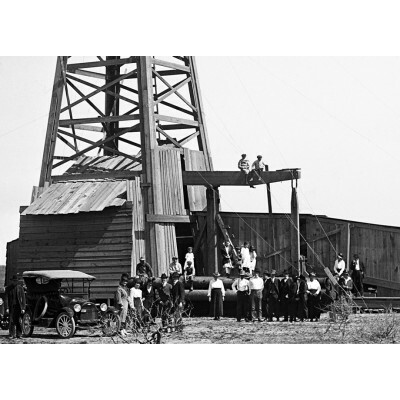 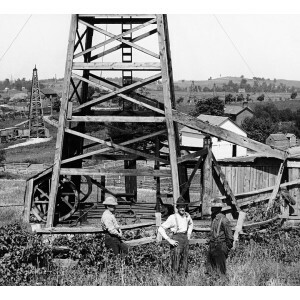 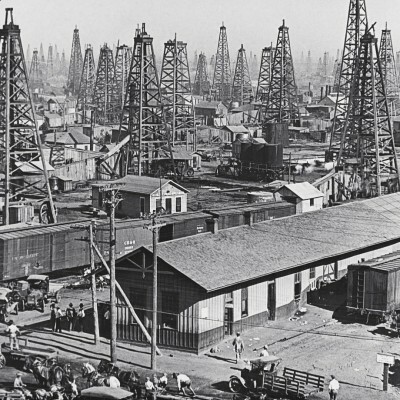 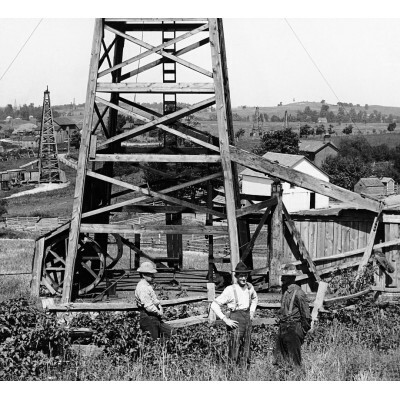 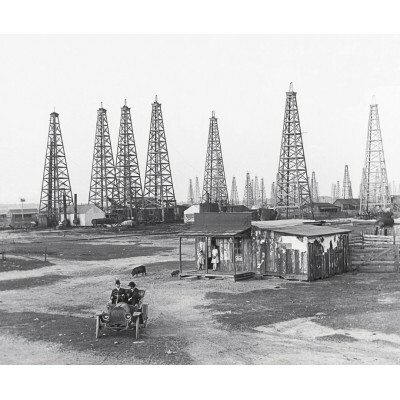 Early Oil CompanyFriends, family and investors gather for a picture with their oil wellPlease see "S.. 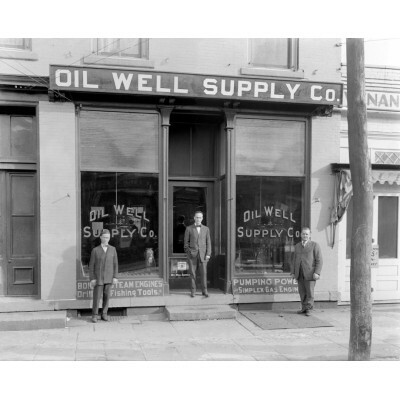 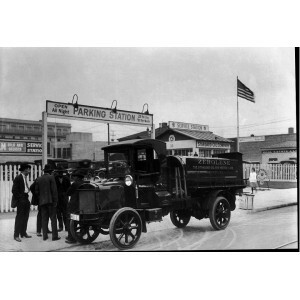 Empire Gas and Fuel- Stapleton Well No. 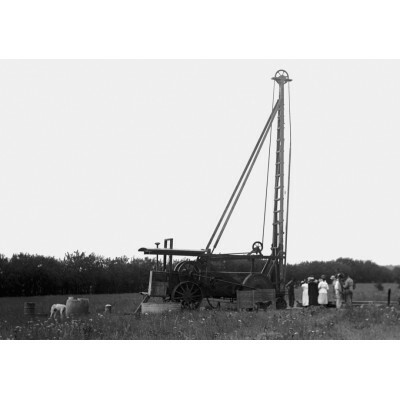 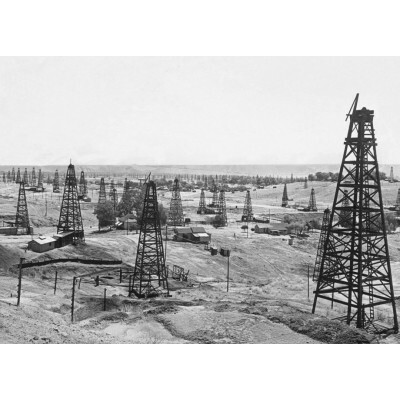 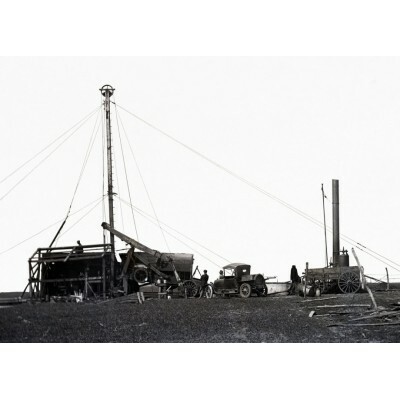 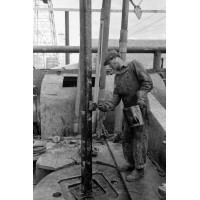 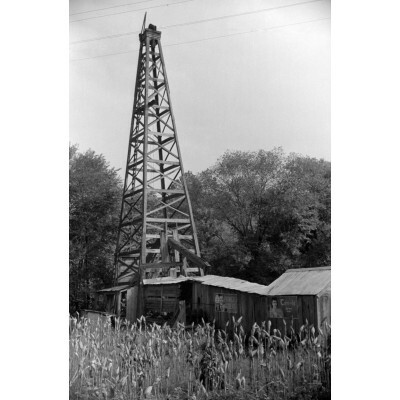 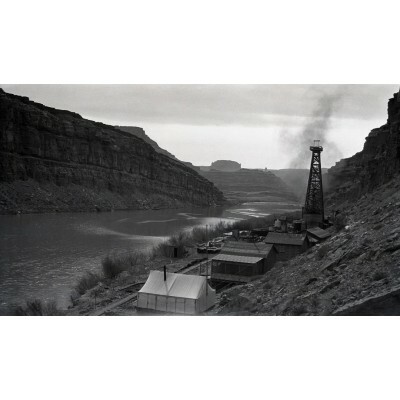 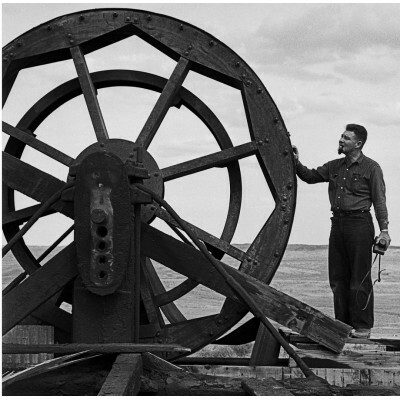 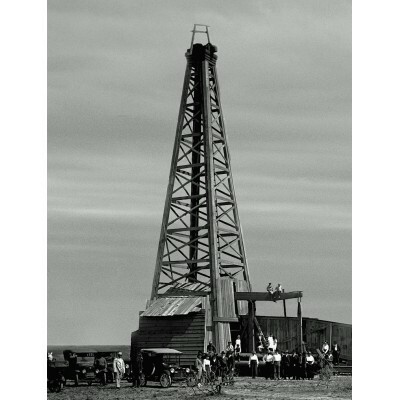 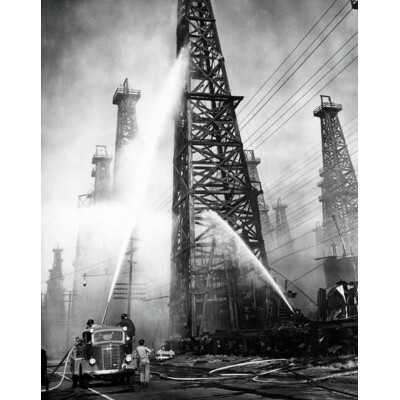 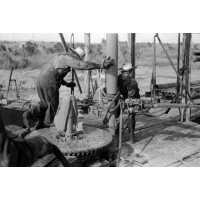 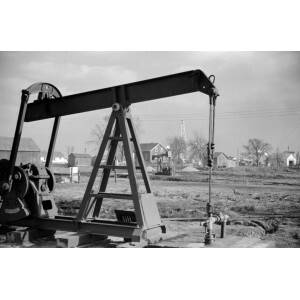 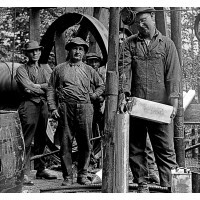 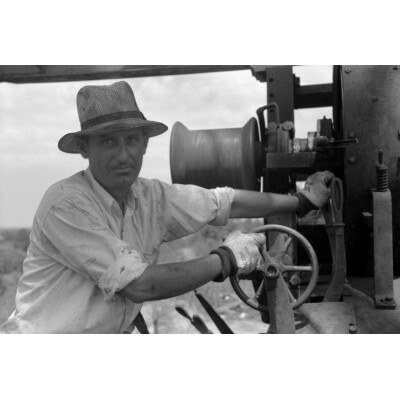 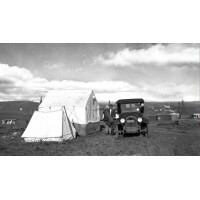 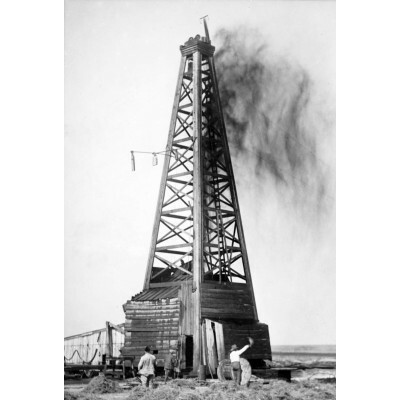 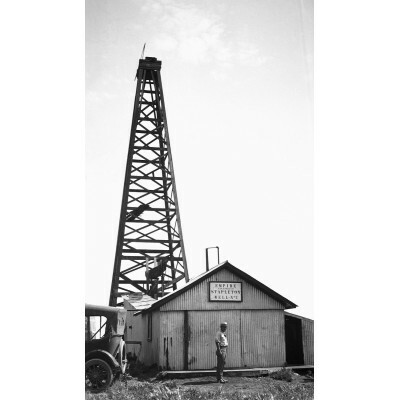 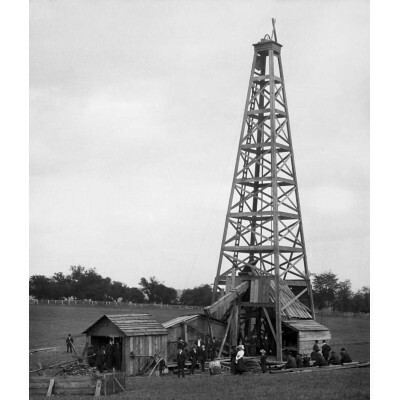 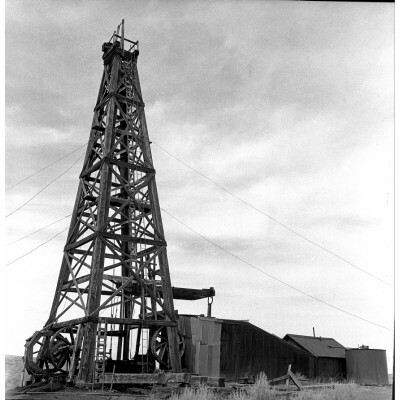 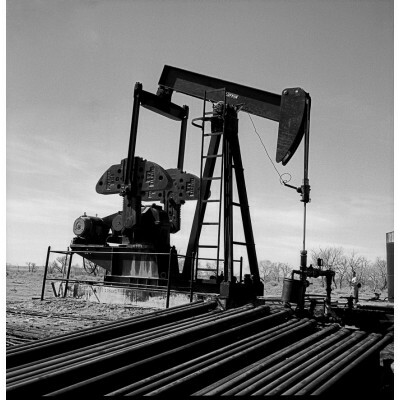 1-KansasAn important well in Kansas oil and gas historyPleas..
Oilfield Near Burkburnett TexasOil Boom near Burkburnett TexasPlease see "SPECIFICATION" tab (above)..
Wildcat 1922 Okemah OklahomaEarly Wildcat well near Okemah OklahomaPlease see "SPECIFICATION" tab (a.. 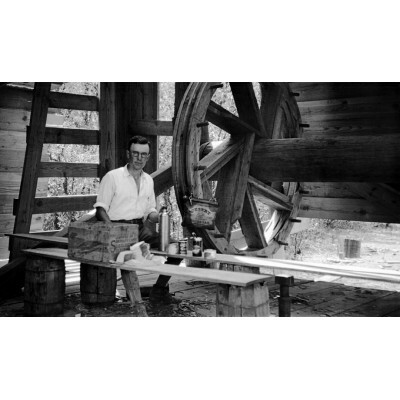 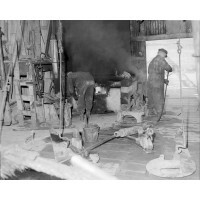 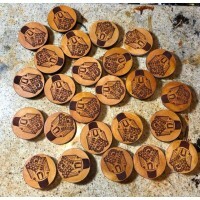 Wooden DerrickCompleted producing well with wooden derrick and walking horsePlease see "SPECIFICATIO.. 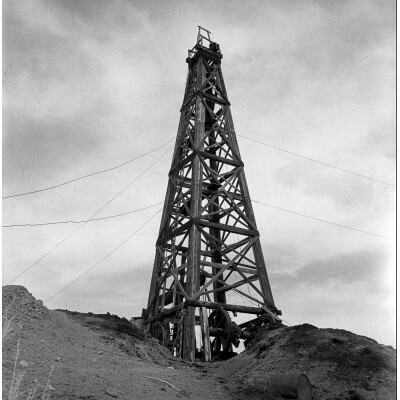 Wooden Oil Rig Derrick Old wooden derrick seems to have dug itself into a holePlease see "SPECI..
Oilwell Supply Store Circa 1890Oilwell Supply Stores were important businesses to keep the drillers ..
Cable Tool Rig 1903 Oklahoma Indian TerritoryThis old cable tool Spudder was used to drill an early ..
Lufkin Pump JackLarge pump jacks like this Lufkin were needed to pump from always increasing hole de..